THE conspicuous place in the history of the Dietetic Reformation, which the most renowned name in Hellenic (metaphysical) philosophy, and the most famed of all the prose writers of Antiquity, has deserved, depends rather upon the general tendency of his anti-materialistic speculations than upon any very direct teaching in that practical direction of human thought. As already indicated in the sketch of the Pythagorean philosophy, Plato—as his name Platon, according to the received English custom, has been unnecessarily Latinised—in some important respects, may be regarded as the lineal descendant of Pythagoras. How much this is true is evident in the development of New Platonism, in which the most distinguishing principle of the original school formed the chief characteristic element. One of the most remarkable facts in all biographical history, is the obscurity in which the personal life of the most influential name in the whole range of Metaphysical Philosophy is involved. The prophet of Samos lived, if not actually before the beginning of the historical period, yet before the epoch of (surviving) historical records. Plato lived and taught in, comparatively, a late stage of Hellenic literature, being a younger contemporary of Thukydides and Euripides. Yet little more of his personal life is known to us, with absolute certainty, than is that of his predecessors. Thus much may be received as among the better ascertained, as well as interesting, facts in his career. He belonged to the aristocratic families of Athens—"the eye of Greece"—then, and for many centuries later, the centre of everything most illustrious in Art and Science. His original name Aristoklês (derived from his grandfather, who, in accordance with the prevalent Hellenic custom, conferred the birth-name) similarly with famous leaders in Thought, notably Erasmus and Voltaire, has been almost forgotten for that by which he has been immortalised. The popular accounts of the reasons for this change of name—either to mark the mental quality of breadth of mind, or the physical feature of breadth of brow—may be true but the name of Platon was somewhat common at Athens. In very early youth he seems to have displayed his literary aptitude in the various kinds of poetry—epic, tragic, and lyric—as well as to have distinguished himself as an athlete in the great national Contests or "Games" as they are called in modern speech, the grand object of ambition of every Hellên. He was instructed in the necessary parts of a liberal Hellenic education by the most able professors of the time. He devoted himself, doubtless, with ardour to the pursuit of knowledge, and sedulously studied the systems of philosophy which then divided the literary world. In his twentieth year he attached himself to Sokrates, who was then at the height of his reputation as a Master of dialectics. After the judicial murder of his master, 399, he withdrew from his native city, which, with a theological intolerance rare in pagan Antiquity, had already been disgraced by the previous persecution of another eminent teacher—Anaxagoras—the instructor of Euripides and of Periklês. Plato then resided for some time at Megara, at a short distance from Athens, and afterwards set out, according to the custom of the eager searchers after knowledge of that age, on a course of travels. He is said to have traversed the countries which had been visited by Pythagoras, but his alleged visit to the further East is as traditional as that of his predecessor. The most interesting fact, or tradition, in his first travels is his alleged intimacy with the Hellenic prince of Syracuse, the elder Dionysius, and his invitation to the western capital of the Hellenic world. The story that he was given up by his perfidious host to the Spartan envoy, and by him sold into slavery, may be merely an exaggerated account of the ill-treatment which he actually received. His chief purpose in going to Italy was, without doubt, the desire to become personally known to the eminent Pythagoreans, whose head-quarters were in the southern part of the Peninsula, and to make himself thoroughly acquainted with their philosophic tenets. At that time the most eminent representative of the school was the celebrated Archytas, one of the most extraordinary mathematical geniuses and mechanicians of any age. Upon his return to Athens, at about the age of forty, he established his ever-memorable school in the suburban groves or "gardens" known as Ακαδημια—whence the well—known Academy by which the Platonic philosophy is distinguished, and which, in modern days, has been so much vulgarised. All the most eminent Athenians, present and future, attended his lectures, and among them was Aristotle, destined to rival his master in fame. From about 388 to 347, the date of his death, he continued to lecture in the Academy and to compose his Dialogues. In the intervals of his literary and didactic labours he twice visited Sicily; the first time at the invitation of his friend Dion, the relative and minister of the two Dionysii, the younger of whom had succeeded to his father's throne, and whom Dion hoped to win to justice and moderation by the eloquent wisdom of the Athenian sage. Such hopes were doomed to bitter disappointment. His second visit to Syracuse was undertaken at the urgent entreaties of his Pythagorean friends, of whose tenets and dietetic principles he always remained an ardent admirer. For whatever reason, it proved unsuccessful. Dion was driven into exile, and Plato himself escaped only by the interposition of Archytas. Thus the only chance of attempting the realisation of his idea of a communistic commonwealth—if he ever actually entertained the hope of realising it—was frustrated, The narrative of the first visit to Sicily is found in the seventh Letter (1). We can refer but briefly to the nature of his philosophy. In the notice of Pythagoras it has been stated that Plato valued very highly that teacher's methods and principles. Pythagoreanism, in fact, enters very largely into the principal writings of the great disciple and exponent (and, it may safely be added, developer) of Sokrates, especially in the Republic and the Timæus. The four cardinal virtues inculcated in the Republic — justice or righteousness, temperance or self control, prudence or wisdom, fortitude—are eminently Pythagorean. The characteristic of the purely speculative portion of Platonism is the theory of ideas (used by the author in the new sense of unities, the original meaning being forms and figures), of which it may be said that its merit depends upon its poetic fancy rather than upon its scientific value. Divesting it of the verbiage of the commentators, who have not succeeded in making it more intelligible, all that need be said of this abstruse and fantastic notion is, that by it he intended to convey that all sensible objects which, according to him, are but the shadows and phantoms of things unseen, are ultimately to be referred to certain abstract conceptions or ideas, only to be attained by pure thinking. Hence he asserted that "not being in a condition to grasp the idea of the Good with full distinctness, we are able to approximate to it only in so far as we elevate the power of thinking to its proper purity." Whatever may be thought of the premiss, the truth and utility of the deduction may be allowed to be as unquestionable as they are unheeded. This characteristic theory may be traced to the belief of Plato not only in the immortality, but also in the eternity, of the human soul. In the Phœdrus, under the form of allegory, he describes the soul in its former state of existence as traversing the circuit of the universe where, if reason duly control the appetite, it is initiated, as it were, into the essences of things which are there disclosed to its gaze. And it is this ante-natal experience which supplies the fleshly mind, or soul, with its ideas of the beautiful and the true. The subtlety of the Hellenic intellect and language was, apparently, an irresistible temptation to their greatest ornaments to indulge in the nicest and most mystic speculation, which, to the possessors of less subtle intellects and of a far less flexible language, seems often strangely unpractical and hyperbolic. Thus, while it is impossible not to be lost in admiration of the marvellous powers of Helenic dialectics, it is at the same time matter for profound regret that faculties so extraordinary should have been expended (we will not say, altogether wasted), in so many instances, on unsubstantial phantoms. If, however, the transcendentalism of the Platonic and other schools of Greek thought is matter for regret, how must we not deplore the enormous waste of time and labour apparent in the theological controversies of the first three or four centuries of Christendom—at least, of Greek Christendom—when the omission or insertion of a single letter could profoundly agitate the whole ecclesiastical world, and originate volumes upon volumes of refined, indeed, but useless verbiage. Yet even the ecclesiastical Greek writers of the early centuries may lay claim to a certain originality and merit of style, which cannot be conceded to the "schoolmen" of the mediæval ages, and of still later times, whose solemn trifling—under the proud titles of Platonists and Aristotelians, or Nominalists and Realists, and the numerous other appellations assumed by them—for centuries was received with patience and even applause. Nor, unfortunately, is this war of Phantoms by any means unknown or extinct in our day. It was the lament of Seneca, often echoed by the most earnest minds, that the greater part of our learning is expended upon words rather than upon the acquisition of wisdom (2). Plato, it has been already observed, deserves his high place among the Immortals, not so much on account of any special originality, or on account of any direct or substantial results from his speculative and transcendental philosophy, as on account of its general tendency to subordinate the lower to the higher nature—to refine and, so to speak, spiritualise human thought; nor was his non-transcendental speculation so altogether original as seems to be generally held. He takes a prominent place in this work in that he may be regarded, to a large extent, as the second founder of Pythagoreanism. That he may justly be so claimed appears evident to careful readers of his writings; and the authority of Cicero, the most distinguished (Latin) New Academic, is express that the principles of Pythagoras form the ground work of Platonism. (De Republicâ). Another incidental corroboration of this assertion is found in Plato's special admiration for the comedies of the Pythagorean Epicharmos (3). Of all the Dialogues, the most important and interesting is the Republic, as it is entitled in English versions (4), the one of his writings upon which Plato seems to have employed most pains, and in which he has recorded his most mature reflections. Next in interest and also, in importance may be ranked the Phïdon, the most famous and perhaps, most generally read of all his productions. Its interest consists in its being the outcome of his speculations on the nature of continued existence, or "immortality," of the human soul; and in its immense influence, direct or indirect, on Christian ideas. While the Phœdon has all the charm of the style of Plato, its fantastic speculation, it must be admitted even by his most ardent admirers, detracts very largely from its value as a philosophical inquiry (5). The Plœdrus perhaps the most meritorious for style of all the Platonic Dialogues derives its interest from the beauty of the language, and from the fact of its being one of the few prose writings of Antiquity, in which the charms of landscape are described with something like enthusiasm. Perhaps, next to the Phœdon, the most read of the Dialogues is the Symposion, in which the subject of Eros—or Passionate Love—is treated in a characteristically Platonic and transcendental style. But, from the ethical point of view, after the master-piece none of the Platonic Dialogues contains so much of the truer spiritualistic philosophy as the Second Alkibiades. Although held by most critics, old and modern, to be the production of a disciple (the author of the Kyropœdeia and the Œconomikos) it may, at all events, be regarded as a pretty faithful reflection of the ideas of the Master. In it the barbarous superstition of propitiatory sacrifice, in language almost worthy of Lucian, is held up to reprobation and ridicule:—"The deity" affirms the writer, "is not to be corrupted with bribes like a usurer. For it would be a very horrible and most unworthy thing for the Gods to have more regard to our gifts and sacrifices than to our souls, in distinguishing those that are really righteous. But they have regard only to our souls, and not at all to our processions or sacrifices, upon which the most profligate persons, and those States whose crimes both against the Gods and men rise to the greatest height, commonly value themselves more than they do on good men. So that it seems plain that nothing is so precious, in the sight of Gods and men, as wisdom and justice." "With much respect be it spoken, you who profess to be admirers of justice, beginning with the heroes of old, have every one of you, without exception, made the praise of Justice and the condemnation of Injustice turn solely upon the reputation and honour and gifts resulting from them. But what each is in itself, by its own peculiar force as it resides in the soul of its possessor, unseen either by gods or men, has never, in poetry or prose, been adequately discussed, so as to show that Injustice is the greatest bane that a soul can receive into itself, and Justice the greatest blessing. Had this been the language held by you all from the first, and had you tried to persuade us of this from our childhood, we should not be on the watch to check one another in the commission of injustice, because everyone would be his own watchman, fearful lest by committing injustice he might attach to himself the greatest of evils." It is the fifth Book, however, which has always excited the greatest interest and controversy, for therein he introduces his Communistic views. Our chief interest in it consists in the fact that it is, in part, the original of the ideal Communisms of modern writers—the prototype of the Utopia of More, of the New Atlantis of Francis Bacon, the Oceana of Harrington, and Gaudentio di Lucca of Berkeley, &c., and other similar ideal States. In maintaining the perfect natural equality of women to men (6), and insisting upon an identity of education and training, he advances propositions which, perhaps, only the more advanced of the assertors of women's rights might be prepared to entertain. 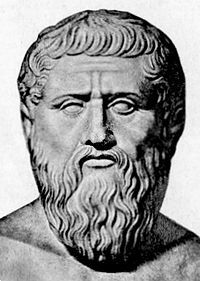 Whatever may have been said by the various admirers of Plato, who have been anxious to present his political or social views in a light which might render them less in conflict with modern Individualism, there can be no doubt for any candid reader of the Republic that the author published to the world his bonâ fide convictions. One of the dramatis personæ of the dialogue, while expressing his concurrence in the Communistic legislation of Sokrates, at the same time objects to the difficulty of realising it in actual life, and desires Sokrates to point out whether, and how, it could be really practicable. Upon this Sokrates (who it is scarcely necessary to remark, is the convenient mouth-piece of Plato) replies: "Do you think any the worse of an artist who has painted the beau idéal of human beauty, and has left nothing wanting in the picture, because he cannot prove that such a one as he has painted might possibly exist? Were not we, likewise, proposing to construct, in theory, the pattern of a perfect State? Will our theory suffer at all in your good opinion, if we cannot prove that it is, possible for a city to be organised in the manner proposed?" As has been well paraphrased by the interpreters to whom we are indebted for the English version: "The possibilities of realising such a commonwealth in actual practice is quite a secondary consideration, which does not in the least affect the soundness of the method or the truth of the results. All that can fairly be demanded of him is, to show how the imperfect politics at present existing may be brought most nearly into harmony with the perfect State which has just been described. To bring about this great result one fundamental change is necessary, and only one: the highest political power must, by some means or other, be vested in philosophers." The next point to be determined is, What is, or ought to be, implied by the term philosopher, and what are the characteristics of the true philosophic disposition? "They are—(1) an eager desire for the knowledge of all real existence; (2) hatred of falsehood, and devoted love of truth; (3) contempt for the pleasures of the body; (4) indifference to money; (5) high-mindedness and liberality; (6) justice and gentleness; (7) a quick apprehension and a good memory; (8) a musical, regular, and harmonious disposition." But how is this disposition to be secured? Under the present condition of things, and the corrupting influences of various kinds, where temptations abound to compromise truth and substitute expediency and self-interest, it would seem all but impossible and Utopian to expect it. "How is this evil to be remedied? The State itself must regulate the study of philosophy, and must take care that the students pursue it on right principles, and at a right age. And now, surely, we may expect to be believed when we assert that, if a State is to prosper, it must be governed by philosophers. If such a contingency should ever take place (and why should it not? ), our ideal State will undoubtedly be realised. So that, upon the whole, we come to this conclusion: The constitution just described is the best, if it can be realised; and to realise it is difficult, but not impossible." "Glaukon here interrupted me, remarking, 'Apparently you describe your men as feasting, without anything to relish their bread (7). Contemporary with the great master of language was the founder of Medicine, Hippokrates, (460-357) who stands in the same relation to his science as Homer to Poetry and Herodotus to History—as the first historical founder of the art of healing. He was a native of Kôs, a small island of the S.W. coast of the Lesser Asia, the traditional cradle and home of the disciples of Asklepios, or Æsculapius (as he was termed by the Latins), the semi-divine author and patron of Medicine. And it may be remarked that the College of Asklepiads exercised a despotism as severe as that which obtains, for the most part, with the modern orthodox Schools. Among a large number of writings of various kinds attributed to Hippokrates the treatise On Regimen in Acute Diseases, which is generally received as genuine; and On the healthful Regimen , which belongs to the same age, though not to the canonical writings of the founder of the school himself. He was the author, real or reputed, of some od the most valuable apophthegms of Hellenic antiquity. Ars longa—Vita brevis (education is slow; life is short) is the best known and most often quoted. What is still more to the purpose is his maxim—"Over-drinking is almost as bad as over-eating." Of all the productions of this most voluminous of writers, his Aphorisms, in which these specimens of laconic wisdom are collected, and which consists of some four hundred short practical sentences, have been the most popular. "You shall honour God best by becoming godlike in your thoughts, Whoso giveth God honour as to one that needeth it, that man in his folly hath made himself greater than God. The wise man only is a priest, is a lover of God, is skilful to pray for that man only knows how to worship, who begins by offering himself as the victim, fashions his own soul into a divine image, and furnishes his own mind as a temple for the reception of the divine light." "Let not sleep come upon thine eyelids, till thou hast pondered thy deeds of the day. "Wherein have I sinned? What work have I done, what left undone that I ought to have done? "Beginning at the first, go through even unto the last, and then let thy heart smite thee for the evil deeds, but rejoice in thy good work. "Work at these commandments and think upon them: these commandments shalt thou love. "They shall surely set thee in the way of divine righteousness : yea, by Him who gave to our soul the Tetrad (10) , well-spring of life everlasting. "That thou mayest not hope that of which there is no hope, nor be ignorant of that which may be. "Know thou also, that the woes of men are the work of their own hands. "Miserable are they, because they see not and hear not the good that is very nigh them: and the way of escape from evil few there be that understand it. "Verily, Father Zeus, thou wouldst free all men from much evil, if thou wouldst teach all men what manner of spirit they are of. "Keep from the meats aforesaid, using judgment both in cleansing and setting free the soul. "Give hied to every matter, and set Reason on high, who best holdeth the reins of guidance (11). "Then, when thou leavest the body, and comest into the free tether, thou shalt be a god, undying, everlasting, neither shall death have any more dominion over thee." In reference to this higher philosophy, inculcating that human society itself, for the most part, is responsible for the frightful evils which it chooses to suffer, rather than to trouble itself to abolish (or to mitigate), Professor Clifford, to whom we are indebted for the above version of the Golden Verses, well observes that it reminds the world that "men suffer from preventible evils—that the people perish from want of knowledge." In other words, the principal obstructions to human Progress are always to be found in Ignorance and in Selfishness—in the ignorance of the Ruled, and in the selfishness of the Rulers. In a well-known passage (in The Laws) Plato, or the Platonic writer, pronounces the springs of human conduct to depend principally on diet. "I observe," says he, "that men's thoughts and actions are intimately connected with a threefold need and desire—accordingly as they are properly used or abused, virtue, or its opposite, is the result—of eating, drinking, and sexual affection! (12) He himself [Page 50]was noted for his extreme frugality. Like most of his countrymen, he was a great eater of figs; and so much did he affect that frugal repast that he acquired among the comic poets, the distinguishing title of "the fig lover". The Hellenic people, in general, were noted among Europeans for abstemiousness (13), and Antiphanes the comic poet (in Athemæus) terms them, hyperbolically, "leaf-eaters". The Athenians and Spartans, especially acquired a reputation for frugal living. That of the latter people is proverbial. But as regards the Athenians, and the Hellenes, generally, it is necessary, in this eulogy, to distinguish the Poor from the Rich. For the same poets of the New Comedy, who ridicule the frugality of the mass of the people, contain frequent allusions to the gourmandism and bon vivantism of the wealthy classes. The Platonic Epistles, the genuineness of which has been generally denied, held to be genuine by the historian, Grote. Quæ Philosophia fuit, facta Philogia est. (Ep. cviii.) Compare Montaigne, Essais, i., 24, on Pedantry, where he admirably distinguishes between wisdom and learning. The Comedies of this most distinguished all the poets and writers of the Doric race were inspired by the spirit of the Pythagorean morality as shewn in the fragmentary remains of his dramas. No greater loss to literature has happened than that of the dramas of Epicharmus and Menandros, the excellence of whose ethical philosophy has seldom been equalled by the professed Moralists. The Sicilian dramatist was imitated by Plautus. Following the Latin title. Its more proper title the Politeia ("Polity") in itself does not denote any special form of Government. It means simply the Form of Government. The Latin Res Publica—that political expression so universally abused both in old and modern states—had no exact equivalent in Hellenic language. Of the very remarkable Trance-vision (as it may be styled) which concluded the Republic—the prototype of many later and modern similar Visions. One of the most remarkable of the species is the Nekyomanteia of the great satirist Lucian, a satire upon revolting superstition of the Odysseia xi. In support of this thesis Plato adduces arguments derived from analogy. Among the non-human species the sexes, he points out, are nearly equal in strength and intelligence. In human savage life the difference is far less marked than in artificial conditions of society. "Opson—the name given by the Greeks generally to everything which they regarded rather as a "relish" than a necessary. Bread was held to be—not only in name but in fact—the true "staff of life." Olives, figs, cheese, and, at Athens especially, fish were the ordinary Opson. Athenæus states that the term was properly appropriated to fish-eating, and was, in fact, deservedly so applied—" because men are so exceedingly enamoured of this kind of food."—Delpnosolh. vii. 5. Translated by Davies and Vaughan. 1874. Sparkling draughts, which they carry about, and replenish the goblet."
. . . . . self-control? The four sacred Pythagorean virtues—justice, temperance, wisdom, fortitude—may be considered a more useful interpretation of this term than the received one—the esoteric name for Deity. Upon which excellent maxim Hieroklês remarks: "The judge here appointed is the most just of all, and the one which is [ought to be] most at home with us," viz. : conscience with right reason. As to eating, the Greek philosopher was of the same opinion as the old Egyptians—"The believed," Herodotus reports, "all diseases, which men are subject to proceed from the food they eat. (ii. 77) Such, too, was the dictum of Plinius (Hist. Nat.) and of Seneca (in many passages and moral writings). The generic Greek word for food ("wheat") is sufficiently significant. One of the most esteemed popular dishes was madsa, barley bread, or cake. Lupines, beans, onions, olives, honey, dates, and figs, with fish occasionally, formed the principal dietary of the poorer classes. See the Deipnosophistœ of Athenræus, a repertory of Hellenic Gourmandism. The eating of fleshmeat, it has been stated by Prof. Mahaffy, must have been almost confined to sacrificial feasts; for, in ordinary language, butcher's meat was called "victim." This is true only of the poor or poorer people. Next to vegetable foods, fish (with the Attic people, in particular) was the most sought after and preferred to anything else. Opson, a word so familiar to all readers of Hellenic literature, was especially appropriated to it. See Deipnos vii. 5. Even so unlikely a poet as Aristophanes—the most splendid poet of Comedy in all Literature—shows some traces of the humaner spirit. See ("The Peace"), 823-5; ("The Birds"), 328-335, 37o, 524-538, 1072-1087; ("The Knights"), 593-606. The Republic of Plato (PDF 10mb) trans. Thomas Taylor c.1800. This edition: London, c.1894. In Books II & III Plato (428-347 BC) develops the dietary ideas of Pythagoras. Plato's Republic (PDF 7mb) commentary by Lewis Campbell M.A., LL.D., London, 1902.